2. Nursery schools (part-time) are not regulated in Quebec, Saskatchewan and the Yukon, and so are not included in these figures. 3. Quebec’s figures include school-age spaces which are under the aegis of the Ministère de l’Éducation, du Loisir et du Sport. 5. This figure has been amended to include the new information for New Brunswick. *This figure is inconsistent with data in ECEC in Canada 2006 (Childcare Resource and Research Unit), which was reported in error as 29.4% due to the inclusion of school-age spaces. **This number was calculated for children 0-4 years old so 2012 figures are not directly comparable to earlier figures in PEI, NB and BC. In these provinces, 5 year olds are now included in school-age child care spaces, not in the preschool-age category (this has also been the practice in Quebec for some years). 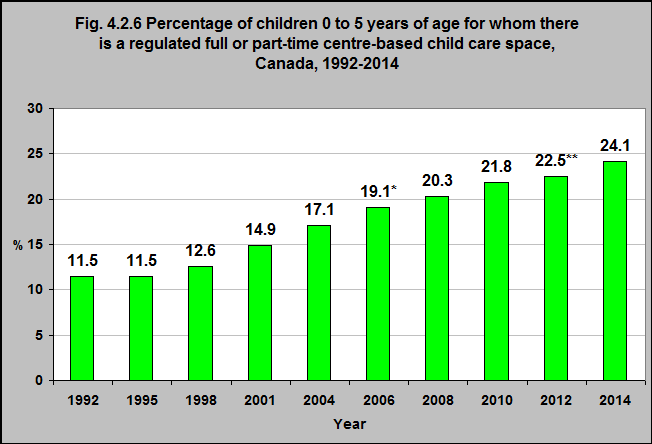 The percentage of young children under 6 for whom there is a regulated full- or part-time centre-based child care space available has increased since 1992 – in fact it more than doubled between 1992 and 2014. However, in 2014 there were still only regulated full- or part-time centre-based spaces for 24% of children under 6.